My other collective love is all the amazing decorative papers they have at a fav store of mine - Paper Source. I buy sheets and sheets, pin them on the wall and gaze ~ so many fun colors and patterns. The collection is actually getting a bit ridiculous! Simple enough... wrap your favorite patterned craft paper around the coffee can, secure with double-stick tape and fill with fun items! 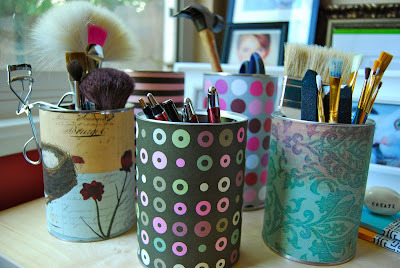 Could even be a great vase since the coffee cans are water proof (careful not to get the paper wet). Gift idea: I'm making a few little back to school care packages filled with some essentials to start off the year on a creative note! What would your gift theme be?